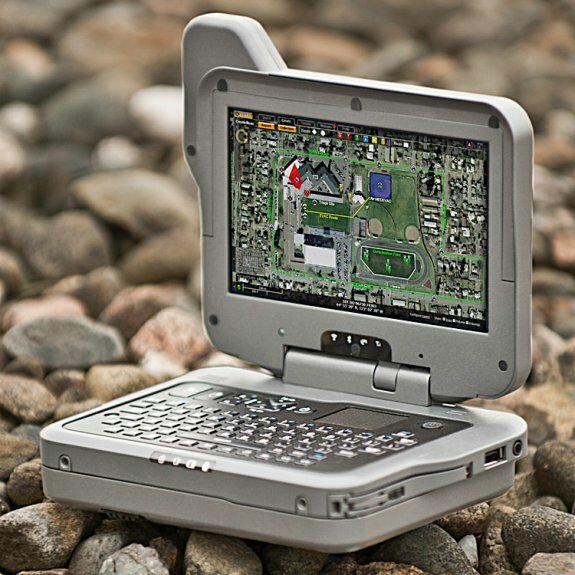 General Dynamics Itronix announced the GD2000, a pocked-sized rugged PC for harsh environments. The device has a 5.6" screen and a notebook-like form factor. Pricing starts at $4,900. General Dynamics Itronix introduces the new, fully rugged, pocket-sized GD2000. About the size of two stacked paperback books, the GD2000 provides the ultra-mobility of a handheld computer with the powerful performance of a full-sized notebook. The ideal combination of size, weight and power, the GD2000 weighs just over two pounds and comes equipped with the Intel® Ultra Low Voltage Core™ Solo processor, highly sensitive GPS and a 5.6-inch daylight-viewable DynaVue® touch-screen display. For military, law enforcement, emergency first responders and field service personnel working in environments where conditions are harsh and space is limited, the fully rugged GD2000 delivers mission-critical wireless, full-power computing. Battery-conserving, sunlight-viewable DynaVue touch screen display delivers crisp, clear images of maps and videos in full sunlight. New zoom-in/zoom-out keyboard button lets users quickly and accurately adjust map and image views. Integrated hard drive slot enables users to easily swap hard drives without tools. ‘On the fly’ Lithium-ion battery changes improve user productivity. Updated Trusted Platform Module security chip and user authentication software protect the GD2000 from unauthorized access. Available with a number of options, the General Dynamics Itronix GD2000 list price starts at $4,900.